From May to October 2017, the Free SF Coalition and Interfaith Movement for Human Integrity facilitated 16 Sanctuary Dialogues in Bay Area congregations and organizations in order to expand our moral vision around sanctuary and actions toward community safety. 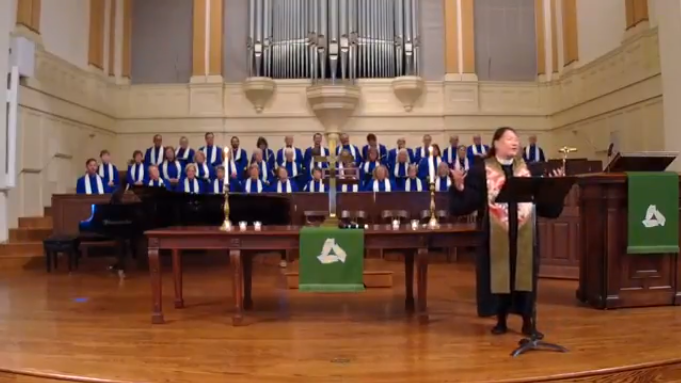 During a Sanctuary Dialogue, speakers share their migration journeys at congregations’ worship services while also bringing awareness to the impacts of current and historical immigration and criminal justice systems. In light of San Francisco’s history as a Sanctuary City and Sanctuary Movement by people of faith, our hope is to humanize the immigrant narrative especially for those most in danger for deportation – immigrants who also hold a former conviction. Here is Interfaith Movement for Human Integrity staff Sarah Lee and Ke Lam, Sanctuary Dialogue speaker and Re-Entry Coordinator at Asian Prisoner Support Committee, sharing at Calvary Presbyterian Church earlier this month.